The FTD Flowing Garden Arrangement bursts with a bounty of blooms to create a stunning tribute of the deceased at their final farewell service. 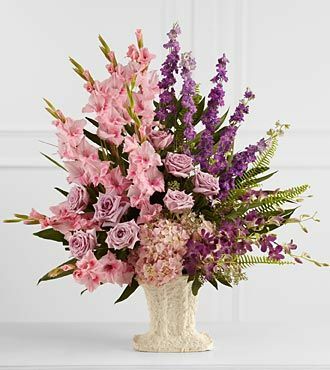 Lavender roses, pink gladiolus, purple dendrobium orchids, purple larkspur and pink hydrangea are accented with an assortement of lush, vibrant greens and perfectly arranged in a papier mache urn to create a presentation of grand beauty that symbolizes the life of the departed. Approximately 42H x 36W.